Hi everyone and welcome. Over at the Frilly and Funkie Challenge blog we are already half way through the latest challenge, 'Planes, Trains and Automobiles'. Here is how our host Kathy Wright Clement describes it: "Summer is a great time to travel. For this challenge, create a vintage or shabby chic travel themed project. Think folded maps, cruise ships, road signs, compasses, passports, trains, planes or automobiles. As long as your project features a travel theme, you're headed in the right direction.."
Flush with the success of my recent seaside themed Junk Journal (and another that is currently under wraps) I decided to make the cover for a new Travel Journal for this challenge. The basic cover for this journal was constructed in the same way as for the previous Junk Journal, though this time the fabric used to cover it was Tim Holtz 'Correspondence, Typo, Neutral' design (a stockist in the UK can be found HERE). I cut pieces of matching 'Correspondence' Paper Stash to cover the inside of the covers before making a start on the outside layers. 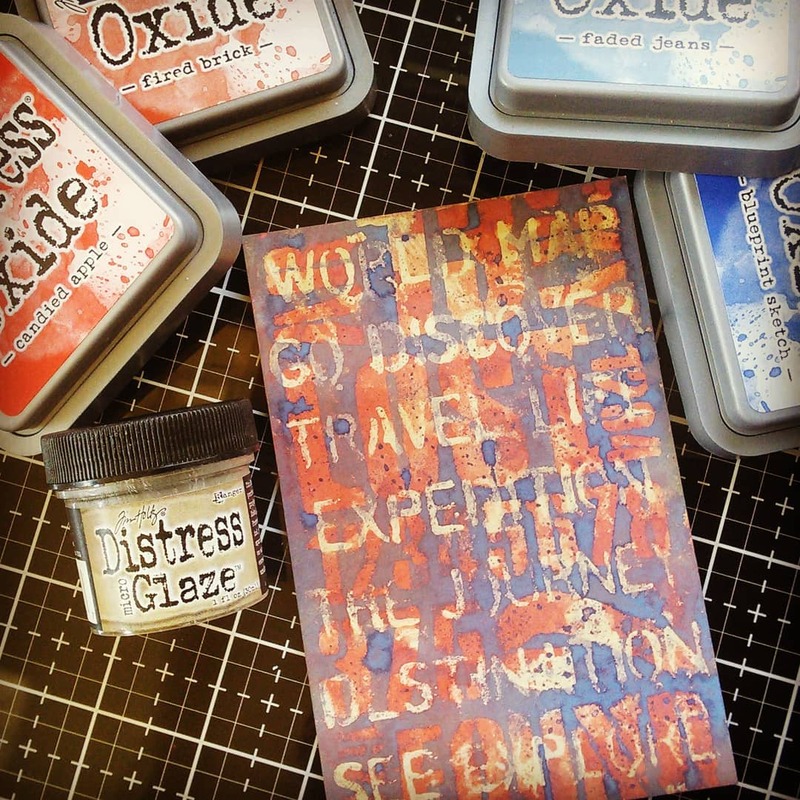 Having cut pieces of Mixed Media Heavystock to fit the front and back cover I employed Tim Holtz Distress Oxide Resist technique, using Distress Micro Glaze, Distress Oxides and two Layering Stencils to produce the background seen below. Many would have left it at this but I decided to add an extra couple of layers, applying a thin uneven layer of Buff Acrylic Paint before blotting beads of dilute Frayed Burlap Distress Oxide Ink over the top for an aged feel. These backgrounds were stitched onto coordinating Classic Kraft Cardstock, sanded to reveal the kraft core. One of the backgrounds was added to the back of the Journal cover on the outside. That's it for my Travel Journal for the current Frilly and Funkie challenge. My talented team mates have also created lots of amazing projects for this challenge so make sure you hop on over and check them out HERE. And remember to link up your own shabby chic or vintage floral projects to be in with a chance of winning one of the fabulous prizes. Jenny, I could just eat this up! You could easily have stopped at your first process photo, and I'd be perfectly content, but adding the paint layers really weathers your card to perfection! Lovely collage of travel themed elements! Another FABULOUS make! Hugs! You do layers like nobody does layers and the end result is always fantastic - this being no exception. I also love the layering of all the travel-themed stamping and Idea-ology. Fabulous cover! Wonderful! That background is divine! The layers of details and embellishments is fabulous! Beautiful card! 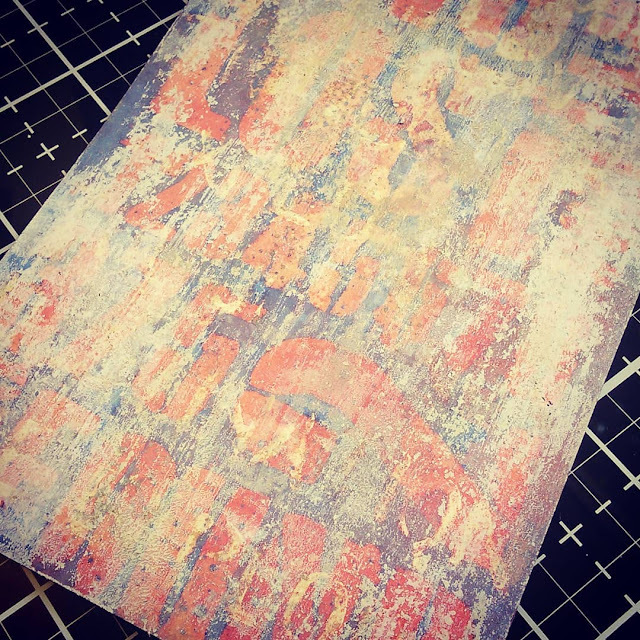 I absolutely love the cover of the journal; the layers of stenciling, ink, paint, and glaze make a beautiful background. Everything adds so perfectly to the themed cover. Thanks for the inspiration. WOW Jenny, I am overwhelmed by all the processes, would love to sit at your elbow and watch you create! Love this! That background is scrumptious! Your use of color always delights me, but especially in this composition! It feels like a holiday! I’m so glad you didn’t cover it all up ...but your details really are marvelous! Wonderful inspiration for a travel journal or mini album. I love your background, all the layers, the stamped map, and the little gears. Absolutely amazing, you are so talented.